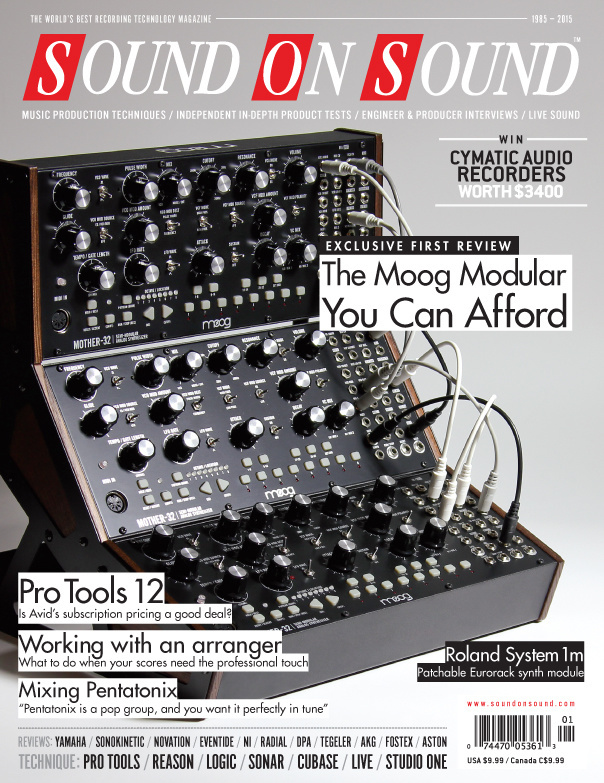 Reviews: Moog Mother-32 (Cover), Roland System 1m, Trident 88, AKG C314, Avid Pro Tools 12, Antelope Audio Pure 2. Techniques: Mix Rescue, Session Notes, Antelope Audio Pure 2. Features: Inside Track: Ed Boyer, Rush: Recording & Mixing R40 Live, Studio File: Livingston. If the name of this new company evokes an iconic British brand, that’s perhaps appropriate — for Aston design and build all their mics in the UK! The new features promised in Pro Tools 12 are finally starting to arrive. Can Avid persuade existing users that it’s time to start paying annual fees? DPA have long been held in high esteem by classical recordists — and now their recording mic range has been given a major overhaul. Anthology X makes many of Eventide’s signature effects available in native plug–in formats for the first time. Was it worth the wait? Shreddage might sound like a Heston Blumenthal recipe involving Shredded Wheat and cabbage, but it’s actually a Kontakt-based sample engine from Impact Soundworks. Need a go–anywhere sound system for busking, small gigs or simply listening to music on the move? Look no further! A directory of all media pages that hold the associated media for January 2016 audio examples. After 10 years with no major updates, Reaktor bursts back into the spotlight with the ultimate virtual modular rack. Struggle with your strumming? Perhaps NI’s Strummed Acoustic can lend a helping hand. Novation’s new groovebox, sequencer and performance instrument could be this year’s essential synth accessory. Is this the ultimate Swiss Army knife for bassists? Roland have embraced the Eurorack format with their semi–modular System 1m and four Aira effects modules. These files accompany the Sample Shop articles in the January 2016 issue of SOS. Not all digital delay pedals strike the right balance between convenience and quality. How does this one fare? Tascam’s updated nearfield monitor offers commendable performance for a very low price. What’s not to like? Sporting both optical and variable–mu compressors and Pultec–inspired EQ, this German channel strip should make a great recording front end for the modern studio. The Squeal Killer, from Stella Vee Amplification, is a pedal-sized box designed to sit between a harp mic and a tube amp, with the sole aim of reducing feedback. Old and new worlds collide as this 1176 clone is treated to remote control via a VST 3/AAX plug-in. Bus-powered audio interfaces with some additional mixing and monitoring capabilities. While I’m not 100 percent sure I could define exactly what distinguishes intelligent dance music (IDM) from some other forms of electronic music production, Zero-G’s Cinematic IDM library provides over 3GB of sample material aimed at that genre. Merging two different creatures didn’t work out so well for Jeff Goldblum and co in The Fly. But what if you could merge the DNA of two different sounds instead? In our second workshop on Logic Pro X’s Alchemy synth, we look at its creative sample-manipulation capabilities. In their conquest of the pop charts, Pentatonix’s only weapons were the human voice — and the skills of mix engineer Ed Boyer. We pull a problematic live recording back from the brink. We look at corrective and creative vocal tuning in Reason. We look at how to get the most from Live’s Electric instrument. Our engineer describes a novel and affordable way to mic an acoustic guitar duo in a small space. Get acquainted with Sonar’s many EQ options. This month we discuss tracks from Hilary Hahn, Drake, Adele and Rachel Platten. Plus, our Classic Mix: The Kinks 'You Really Got Me' (1964). Make mixing in Cubase Pro 8 that little bit easier with VCA Faders. It’s rare to pick up a popular magazine these days without seeing photographs of people and products airbrushed to a level that’s arguably beyond perfection. This month's in-depth video interview features Grammy-winning producer Scott Jacoby. He welcomes us into his own Eusonia studios in New York to show how he created a ‘60s-inspired track for the former Ronnettes lead singer. Synthesizers: why vintage will always be king. Livingston is one of the oldest recording ventures in London dating back to 1963. Although, or perhaps because, the studio has changed hands and locations a few times, it has remained busy for well over five decades. It’s easy to ignore the question “Is it any good?” — but job satisfaction lies in keeping it in mind. Americana is a loosely defined genre, but in terms of studios, it knows what it wants. Media content for the January 2016 issue.